I had the pleasure of seeing the Dutch built Thunder Star for the first time at the 2005 German Diesel Motorcycle Rally in Hamm. On arrival we'd been told by the organizers to expect the appearance of some ground breaking machines and were not disappointed when firstly the 'Edimo' and then a second Smart engined machine rolled up. But it was very late in the day before the Thunder Star blessed this most unusual gathering of motorcycles with it's presence. At around 10 am on the Sunday morning, a large van emblazoned with the Star Twin motif wound it's way carefully down the somewhat misty, tree lined lane which passes the entrance to Brauhof Wilhaus, an establishment that has been the home of the rally for the past five years or so. With the rally camp site looking decidedly empty at this late stage, it was only the stalwarts that were rewarded with a glimpse, and in several cases a ride, of this revolutionary machine. With the Star Twin transport parked just inside and to the right of the main entrance the crew preceded to off load the Thunder Star while all about eyed this magnificent machine unblinkingly and with mouths gaping. From this point on most of the conversation took place in Dutch, a languages not too far removed from German which, of course, was spoken by the locals. One of the first answers to come across from the ensuing barrage of questions was that the machines late arrival had been due to the fact that Star Twin Motors were unable to get anyone to cover for them in their shop the previous day. This had meant an early start Sunday and a quick dash across the border from their home town of Loenen. With an ear towards the conversation and an eye pressed firmly to my camera's view finder, I set about recording the event for DieselBike.net as best I could. It's at times like these I envy the bigger and more established publications who roll up with their own photographers and expensive equipment. All I had was an absent brother nursing an almighty hangover. Now there was a time when the private bike builder would not have at his disposal such construction aids as personal computers and software like CAD/CAST but, I'm glad to say, times are 'a' changing, as they say. When Star Twin owner Kees van der Starre decided to go ahead with this project he wasted no time in drafting in Jeroen Bernart who was able to create the machine in 3D. Indeed, the CAD/CAST software was instrumental in designing some of the engine castings and helped Bernart develop lightweight and strong parts that make the Thunder Star what it is today, a very reasonable 205 kg bike. 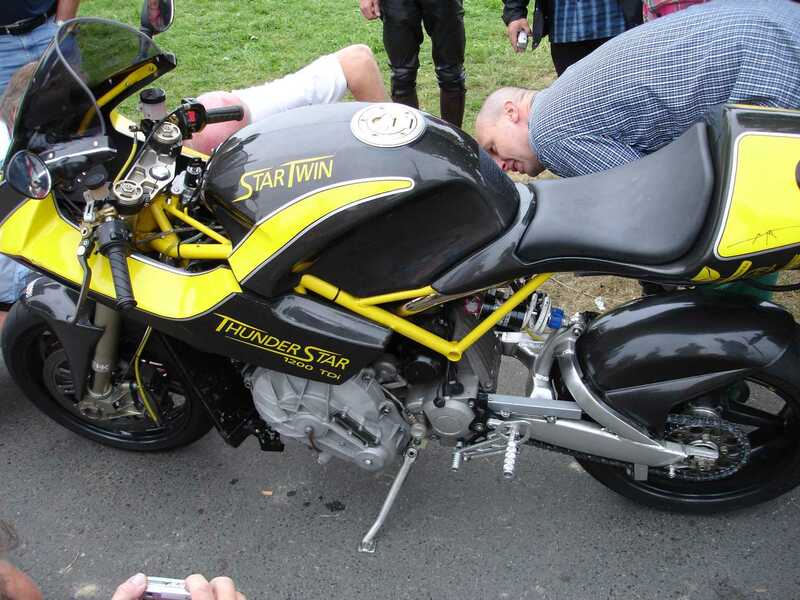 We are told that virtually everything you can see with the naked eye has been designed by Star Twin and that internally, they have utilized both car and motorcycle parts. These in themselves have been adapted, in the case of the car parts, to be lighter, whilst the parts originally meant for two wheeled vehicles have been made stronger. Since the Thunder Star was first unveiled to the general public back at the MoToRai Motorcycle Show in Holland, it will come as no surprise to hear that the most frequent questions directed at the bikes builders have been concerning the machines engine. This is, after all, what it' s all about. Nestling beneath the futuristic black and yellow bodywork is a Common Rail, three cylinder, VW Lupo 1200cc diesel engine with the potential to produce as much torque a Triumph Rocket 3. Like all of today' s best diesel cars it boasts direct injection, a turbo and an intercooler which, for the uninitiated, cools the incoming air and thus increases it' s oxygen content for better combustion. The transmission gives us 5 gears to play with but such is the torque that one hardly needs them. This bike apparently pulls like nothing on earth, wherever you are in the range. 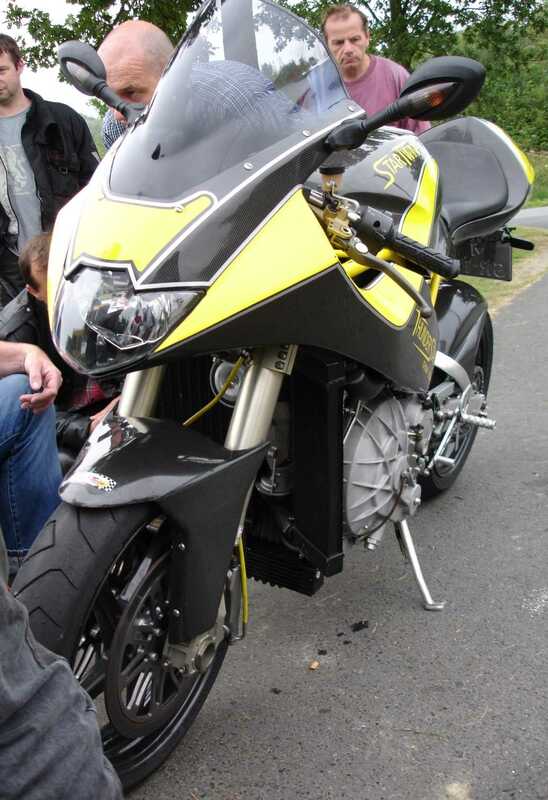 Surely it is this capability that is at the heart of what diesel powered motorcycling of the future will be all about. Riding machines such as the Thunder Star will offer bikers a wholly new power dynamic to play with in the form of roll on acceleration figures to die for. Manufacturers have always kept a close eye on their power to weight figures. Given the differences between the energy delivery of both petrol and diesel engines, not to mention the differing weights, a sea change in thinking is required here for those brave enough to consider making such motorcycles. Kees van der Starre is rightly proud to state that Star Twin have produced probably the most advanced Diesel powered Super-bike to date. With an engine that currently produces approximately 70 bhp in its current state, Kees van der Starre has admitted to deliberately keeping the bike detuned for a time after its creation but he has said they will slowly increase the power until they have a very reasonable 100 bhp and generate around 200-250 Nm of torque. Kees has gone so far as to admit that immediately putting all that power through a dry clutch and chain drive might be a tad dangerous and that is why they are increasing the output slowly. We agree. When questioned about the style of the machine Kees stated that racers were the most challenging and difficult machines to develop. Star Twin chose this path because they know it is easier to transform a racer into a tourer/road bike than visa versa. When asked about a possible production version of the bike Kees stated that while it was possible they may enter into negotiations with another company or companies they were just as likely to produce a small number of the machines themselves. But this would be unlikely as the current machine is a true prototype and to produce similar machines would be uneconomical. If prospective diesel motorcyclists were looking for anything else they may not be surprised to learn that the contents of the Thunder Stars 18 litre tank would take them considerably further than if it contained petrol. The makers claim a fuel consumption figure in the region of 2.5 litres per every 100 km traveled. That' s approximately 150 miles to the Imperial gallon. With the sky beginning to darken somewhat, firstly a Frenchman (he of the Peugeot Kawasaki) and then a fellow countryman, Vim (he of the Daihatsu BMW) took the machine out for short rides. After a quick dash back to the tent I was able to fire up my Canon camcorder and record Vim returning from his rather special and unique ride. 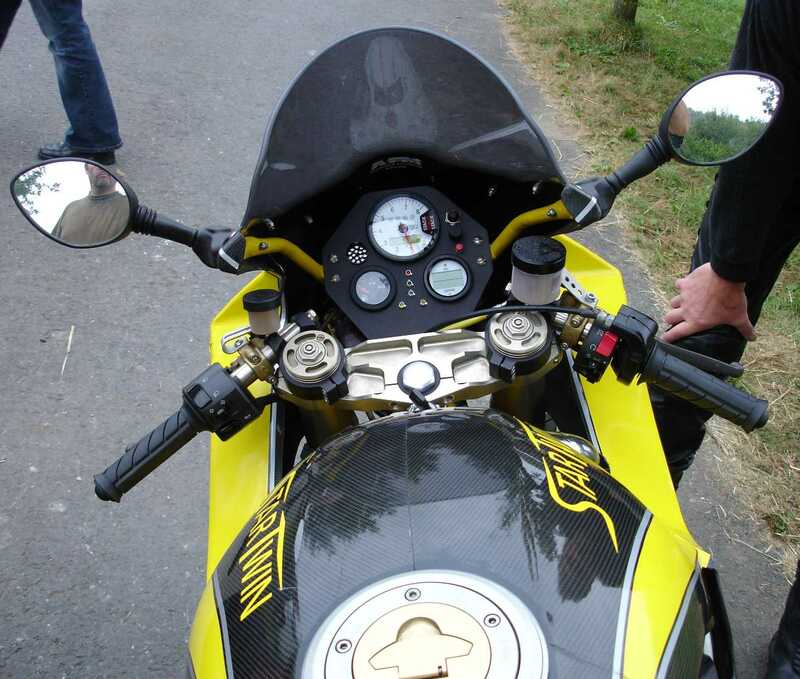 It was interesting to note that while the machine looked every inch the racer, there was, at lower revs anyway, evidence of a slight but distinctive diesel clatter as the bike swung around and passed me. I mention this not as any kind of criticism but more by way of notice that this is just another one of the different characteristics that bikers may have to come to terms with once going diesel becomes an option. These kind of engines have a compression ratio of 1:16 and at these kind of pressures injection mapping and sound proofing will have to improved still further if the noise is to be banished altogether. Not long after the last rider returned, Kees and his crew packed up the Thunder Star and, along with the rest of us rally goers, said their good-byes and set out on their long journey home. In many ways the 2005 Hamm Diesel Motorcycle gathering was a landmark event. Previous years have seen countless generator based machines (my own included) turn up, but this year had been different. For the first time not one, but three electronic diesel injection motorcycles had made an appearance. And if that is not ground breaking in itself, I don' t know what is. 2005 - a vintage year indeed. Full marks go out to the organizers and all those who made it happen.